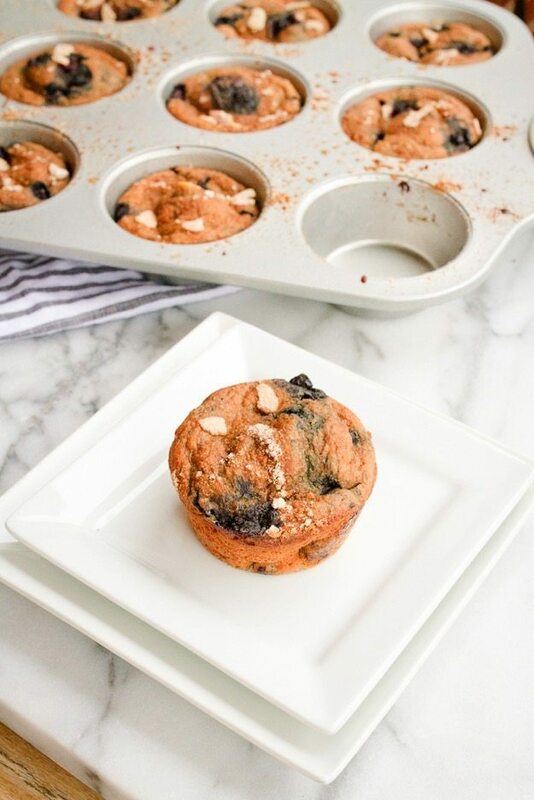 These healthy blueberry muffins are packed with good for you ingredients — gluten-free, low in fat and sugar, high in protein and only 100 calories each! Nothing says happy Sunday like freshly baked blueberry muffins. Am I right? Hopefully so because today I have a lovely little blueberry muffin recipe to share with ya. When I say lovely, I mean it! 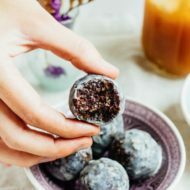 These muffins filled with blueberries, loaded with flavor, perfectly moist and packed with good-for-you ingredients. And because of the swaps, these babies are low in sugar, low in fat, higher in protein, only about 100 calories a piece and way, way healthier than most bakery muffins (which are usually just cupcakes disguised as a breakfast food). They may not look as pretty as bakery muffins, but they make up for it in the taste department. Over the past few weeks I tested three different versions of these muffins and the one I’m sharing today is definitely the winner. It’s been taste-tested by a handful of people including Isaac’s Dad, Dan. Whenever I can get Dan to like my healthy baked goods I consider the recipe a win as he’s brutally honest and my toughest critic. For instance, one time after being asked how he liked the cookies I made, he told me they were okay, but I probably shouldn’t make them again. haha. If you can’t tell, I’m pretty excited about these portable, blueberry-filled gems. I have an inkling that you’re going to love them just as much as I do! Happy Sunday Funday. 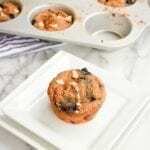 Spray a muffin tin with non-stick cooking spray (I use coconut oil spray), or use paper liners. Combine the almond milk and apple cider vinegar in a glass mixing bowl, whisk and set aside. Combine all the dry ingredients in a large mixing bowl. Create a well in the middle of the bowl. Add the greek yogurt, egg whites and vanilla into the bowl with the almond milk. Stir to combine. Pour the wet ingredients into the dry ingredients and stir just until combined. Fold in the blueberries. Fill each well of the muffin tin ⅔ full. Sprinkle topping mixture over each muffin. 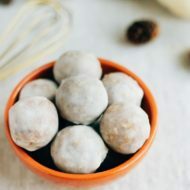 Bake 5 minutes at 425°, while muffins are still in the oven turn the temperature down to 375° and continue baking 15 more minutes or until a toothpick inserted in the middle comes out clean. Allow to cool before removing from tin and serving. Refrigerate leftovers in a covered container for up to one week. Eat cold or reheat in the toaster over before serving. *Feel free to use whatever brand of protein powder you have on hand. I used Sunwarrior. *If you want to keep the recipe dairy-free, you can use dairy-free coconut or almond yogurt. *If you don’t have oat flour, you can make your own by grinding rolled oats in a food processor or blender. Whole wheat flour will also work if you’re not gluten-free. These look great! I don’t have protein powder and haven’t ever used it before. Is there anything that can be substituted for the protein powder? I really do not get enough muffins in my life. These sound delicious! i am in love with blueberry muffins! love the protein powder addition in these. i’ve been playing around with adding it and it can be tricky to get it right. these look fab. 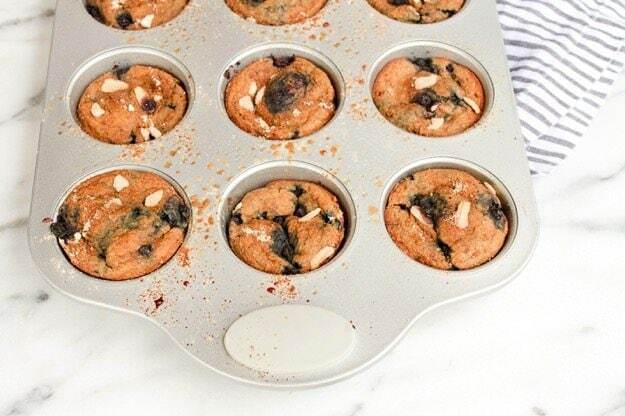 Blueberry muffins and protein powder?! I am in LOVE with these lovely little muffins. The perfect breakfast or snack! Pinned! Fabulous little muffin! Blueberry has always been my favorite! Love all of the substitutions. 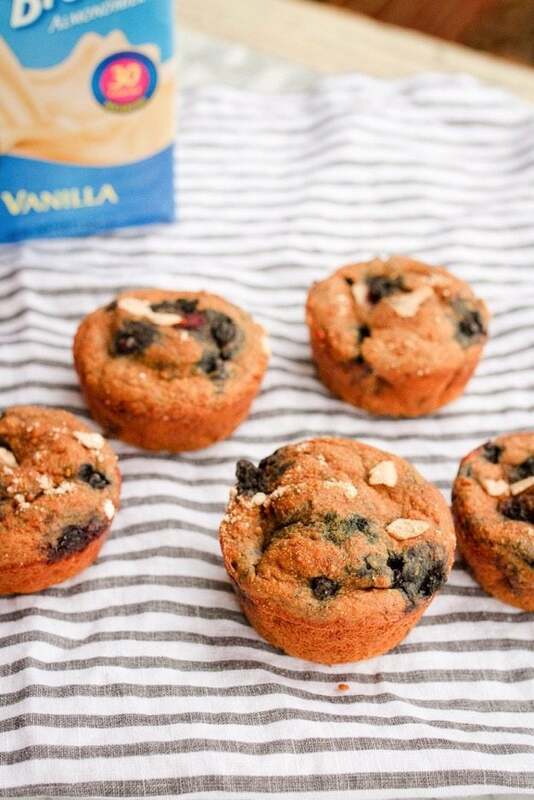 Wonderful blueberry protein muffins. Now I am wishing I had fresh blueberries! Such smart swaps and they look delish! Since it is food prep Sunday, I am going to make these for me and the hubs for some breakfasts this week. Thank you for all of the wonderful recipes! I can’t find almond flour or meal in the UK (except for one bag for £15 or $22!) so can I use ground almonds instead, like the £2 bags from Tesco or Sainsbury’s? Thanks! 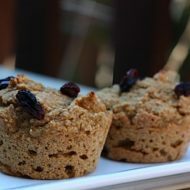 I love these muffins- I’ve made them a few times; they make a great pre or post workout snack! Quick question though – my blueberries end up at the bottom and make them kinda soggy. Any tips or tricks to keep them more afloat? I’ve used both frozen and fresh. Hi Becca! I’m so glad that you like this recipe. 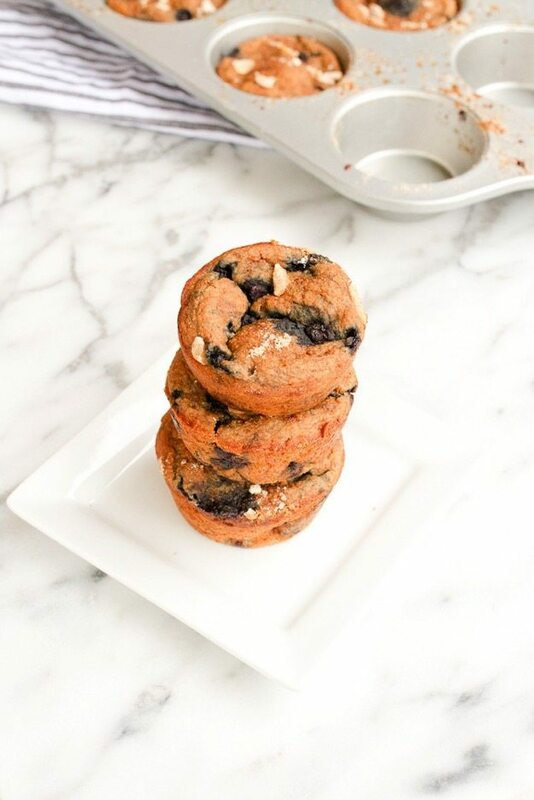 Here’s a quick tip I found to help with the blueberries sinking: try tossing them in a tablespoon or two of flour from the recipe’s dry ingredients — just enough flour to give them a coating. Then, fold the flour-coated berries into the batter as the very last step before baking. Let me know if this helps!